The Isle of the Lost, the prequel to the Disney Channel Original Movie The Descendants, has spent more than fifty weeks on the New York Times bestseller list, fifteen at #1, and has over a million copies in print. The Descendants starring Kristen Chenoweth and Dove Cameron is the #1 cable TV movie of 2015, and #5 of all time, and its soundtrack is the #1 bestselling album on iTunes. The Isle of the Lost’s sequel, Return to the Isle of the Lost, is also a #1 New York Times bestseller and spent sixteen weeks on the New York Times List. The third Isle of the Lost book will be published in May 2017. De la Cruz is the author of the Blue Bloods series (with three million copies in print), among many others. Her first series for adults launched with Witches of East End, which People magazine called a “bubbling cauldron of mystery and romance.” The bestseller was followed by Serpent’s Kiss and Winds of Salem. Lifetime Television aired a two-season drama series based on Witches of East End, starring Julia Ormond, Jenna Dewan-Tatum, Rachel Boston and Mädchen Amick. De la Cruz’s young adult spin-off of the series, Summer on East End has also been optioned for television. 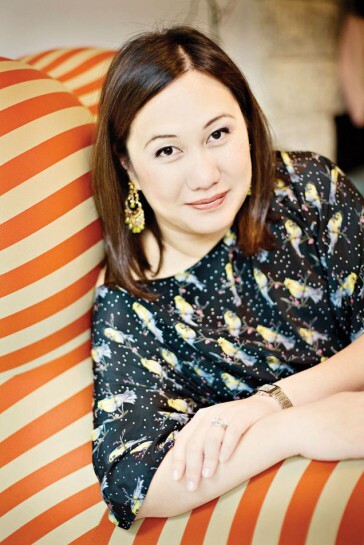 Her recent books include Something in Between, a YA contemporary novel inspired by de la Cruz’s own immigrant experience coming from the Philippines which launched the Seventeen imprint at Harlequin Teen, as well as Alex and Eliza, a historical novel about the romance between Alexander Hamilton and Elizabeth Schuyler, forthcoming from Penguin Teen in April 2017. Angel Falls, a television movie she wrote for the Hallmark Channel, will premiere this December as part of the network’s Countdown to Christmas and will star Rachel Boston from Witches of East End. Pride, Prejudice and Mistletoe, her latest novel for adults will be published by St. Martin’s and Melissa has also written the script for the television movie. Melissa de la Cruz lives in West Hollywood, California with her husband and daughter.